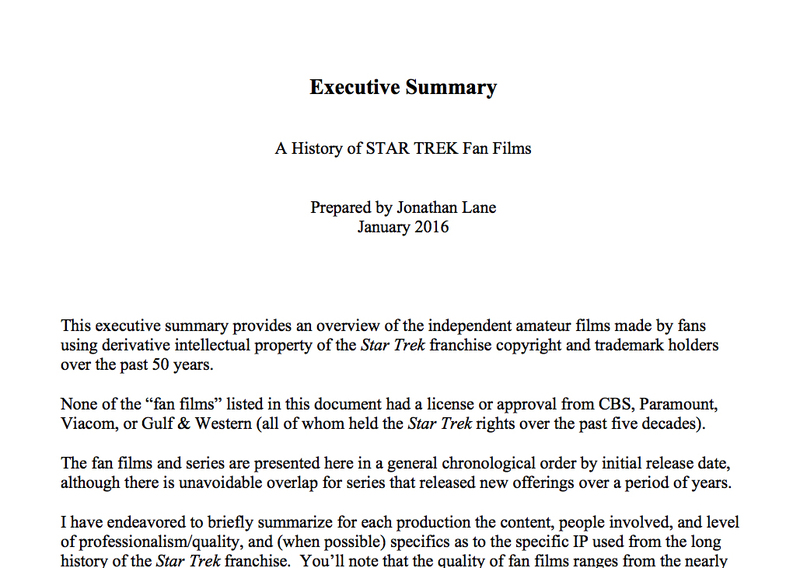 The HISTORY of STAR TREK FAN FILMS…in PDF format! 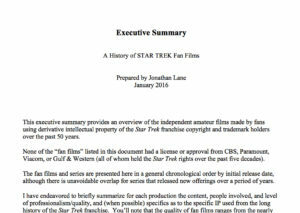 Ever since the AXANAR legal team released my Executive Summary of “The History of Star Trek Fan Films” during the the discovery phase of the lawsuit, readers have been asking me to upload the document here on FAN FILM FACTOR. And here it is! Merry Christmas (or Happy Hanukkah). I had initially written “The History of Star Trek Fan Films” to help out Alec Peters and Axanar. At the time that the lawsuit was first filed a year ago, I didn’t yet understand the intricacies of the case as I do now…and so I almost immediately confused copyright with trademark. I was wrong about that, and so my efforts wouldn’t help Alec win the case outright. But my document would still end up being useful in helping to argue for non-willful infringement if the jury found Alec Peters guilty of infringement. As I’ve mentioned in previous blogs, willful infringement carries a penalty of $150,000 per violation. Non-willful infringement carries penalties as low as $200 per violation. So the difference between the two types of infringement in a verdict could literally be millions of dollars! And how can my document help to prove non-willful infringement? Well, non-willful simply means that the infringer had a reasonable belief that he was not actually infringing…even if he did. So the more Star Trek fan films I could find that were never challenged or sued or even contacted by CBS or Paramount or Viacom, the more it would (hopefully) appear to the judge and jury that the studio copyright holders had been pretty much okay with the existence of Star Trek fan films for all these decades. And if the judge and jury could reasonably conclude that the studios weren’t bothered by Star Trek fan films (up until Axanar, of course), then it would be fair for them to assume Alec Peters would have thought the same thing. And–PRESTO!! !–non-willful infringement! So really, the more Star Trek fan films I could find, the better. And what I wound up with turned into a 128-page document! But the document was never really intended to go public. I wrote it primarily for the legal team to use as reference. As such, it concentrates mainly on the content of each fan film, how much Star Trek intellectual property it used, how much money (if any) was raised through crowd-funding, and how many people (approximately) had viewed it online. Proof-read – I rushed to get this out as quickly as I could. That meant weeks and weeks of Internet research, a veritable scavenger hunt for Star Trek fan films, and a feverish mad dash to write down as much as I could. Checking for typos would have slowed down the process, and remember, I assumed that only Alec Peters and his lawyers would ever see it. Complete – Star Trek fan films date back nearly 50 years, and they’re made by Trekkers around the world. I have no doubt that I missed at least something, possibly many somethings. This was the best I could do on short notice, and it still represents over 100 fan films and series with more than 250 hours of filmed fan Trek. Up to date – This was a snapshot of the Star Trek fan film universe last January. A LOT has happened since then! Many projects have been completed and released, others changed or re-titled, new ones launched, and a couple canceled. So if yoThe History of Star Trek Fan Filmsu see something that seems out of date…that’s ’cause it is! Meant to “tattle” on fan films – I thought long and hard about whether I was writing something to throw all fan films under the bus. But the fact is, there’s nothing “secret” in anything I’ve mentioned. It’s all out there on the Internet. Had CBS and/or Paramount wanted shut down any/all fan films, they didn’t need my list. In fact, all of this information is already conveniently collected on the amazing Star Trek Reviewed blog site. In fact, that blog has even more information than I ever found because they also cover audio dramas (I didn’t have the time to research those). Ready to be a book yet – Yes, I’ve thought about it, so no need to make the suggestion. I’m way ahead of you. A sincere effort to help my friends – I’m not just a supporter of Axanar, I also consider many of the people associated with the project to be my friends. This document represents my desire to help them in the best way I knew how to at the time. I’d already been writing “Fan Film Friday” blogs on the Axanar website, so if anyone was becoming an expert on the subject, it was I. A labor of love – I did not get paid to create this. Technically, I own it. And although Alec did contact me asking if I could write up something like this for the legal team, the truth is that I’d already started to do just that a week before he got in touch with me! A good start – In many ways, this document was the catalyst in the creation of the FAN FILM FACTOR blog. So why don’t I just copy-paste all the entries from there onto this site? Three reasons. 1) Those blurbs are short and, in most cases, only give a short glimpse into each fan film or series (I prefer deeper dives). 2) They were intended for lawyers going into court and focused on things that wouldn’t be as important on this blog site. And 3) if I dumped everything out all at once, what would I talk about week after week? Parsing out the fan film features over time (and including interviews when possible) means I have enough content to stretch things out here over at least the next few years. And there you have it–the history of “The History of Star Trek Fan Films.” Enjoy the (long) read, and I welcome your feedback…especially if it’s good feedback! A fun trip through the history of Star Trek fan films, Jonathan, no matter its original intent! Am I right in thinking that “Amutt Time” could be the *first* successful Kickstarter for a Star Trek fan film? Even unfinished, uncomplete and uncorrected, this looks amazing. Thanks for sharing this ! And what to say about the STARFLEET Academy program with its huge contents ? And the not less tremendous Memory Alpha database ? Fans are active everywhere, all dealing honestly with IP materials, for the love of Star Trek, and the 50 years old franchise might be worn out as you described it, but it is still alive thanks to its fans. Hadn’t the show have such a fanbase, the Studios would have no more business to do with it. Thanks again for sharing this list, I will now look at the films I missed. (And looking forward for an update as a book). Thanks once again Jonathan. I look forward to all your future writing endeavors. You might even consider writing your blog installments in a form that would fit chapter sections, for future books. I’m sure you have a great new career in the making, all for something you love doing. I can’t wait to see where you take it all. 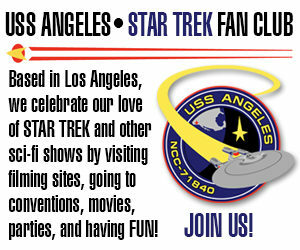 Previous Previous post: The PERFECT stocking stuffer for CHRISTMAS – and SANTA’S even a TREKKIE! Next Next post: BREAKING NEWS – ORAL ARGUMENTS in the AXANAR LAWSUIT have been CANCELED for next Monday!